I love my Suzuki DR650, but the stock seat is a plank. A simple 200-mile ride was followed by three days of bruised backside. Thanks to the folks at Cycle-Analyst, this is no longer a problem. 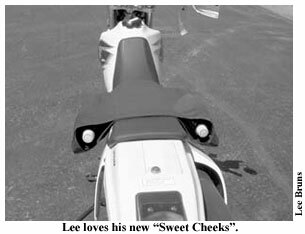 Cycle Analyst sells a product called Sweet Cheeks. It’s a seat cover for dual sport motorcycles that drapes over the stock seat. A pair of (empty) two-liter soft drink bottles is then inserted into the cover, which effectively widens the seat to 14 inches to support your thighs, as well as your entire backside. The hardest part of the installation process was drinking the contents of the two liter pop bottles. The Sweet Cheeks is made from sturdy, 10 oz cotton Duck cloth; double stitched at the seams, with strap down loops on each corner. Canvas duck cloth is very durable and features great tear resistance, with minimal stretch. I first tried it with unpressurized bottles and found an immediate and dramatic improvement. Then I slightly pressurized the bottles by putting them in the freezer for a few hours before screwing the caps on. As the air inside them warmed up, it expanded, increasing the pressure. The slight pressurization made for an even nicer ride, so I tried filling the bottles with water for even more density. Cycle Analyst does offer a small hand pump for pressurizing the bottles, but I didn’t order one. The tune-ability between the right and left sides is especially nice. I found that it worked better for me to run the right side at a slightly lower pressure than the left side to custom fit it to my personal anatomy. An added bonus is the ability to carry 4 liters of clean water while camping. The center panel of the Sweet Cheeks is also a pocket. You can insert a gel pad or additional foam for even greater comfort. Being able to remove the Sweet Cheeks once I arrive at the trail or campground is a nice option that isn’t possible with an aftermarket seat. The only downside is that in making the seat wider, it does make the reach to the ground a bit tricky for those riders with shorter legs. I have found that sliding forward a bit at intersections works fine to help reach the ground. The Sweet Cheeks seat cover is the best $25.00 accessory I’ve purchased in my life. It makes me feel bad for those folks who spend hundreds of dollars on aftermarket seats, only to have a seat that is less comfortable than the stock seat with this low-cost accessory. The company is called Cycle Analyst, but with their ability to alleviate pain maybe Cycle Therapist would be more fitting; or maybe a combination of the two, like ‘Cycle Analrapist’. Sweet Cheeks seat covers are available at Cycle-Analyst.com in West Harrison, Indiana at 812.637.8118. Price is $24.95, which includes shipping. For 5 dollars more, they’ll include two pump caps to allow the rider to fine tune the air pressure.